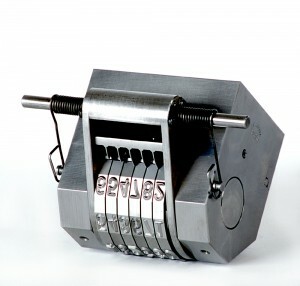 Durable Technologies' numbering heads are typically used for high volume production marking and where versatility for automatic or manual advance numbering is required to stamp repetitive sequences such as product codes, part numbers, date codes, etc. There is virtually no limit to the range of products that can be marked with a numbering head. Numbering heads are designed and built to meet your specific serial numbering and sequential part marking requirements. Our numbering heads are available in a variety of different styles and configurations for both numbering and lettering are provide a reliable way to mark serial numbers and other identification on all types of parts. Click on any of the links to the right for more information on our Numbering Heads. You can also contact us now to speak with someone in Sales. Click here for more information on our line of Impact Presses.